RJF Aristocrat died in an accident 01/07/2019. Aristocrat is sired by 83" TTT, Archer Texa (broke horn back to 78.75" TTT), who is a son of 81.50" TTT, Jamakizm, and 86.8750" TTT, Texana Van Horne. 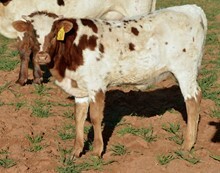 His dam, 75.50" TTT, RJF Sassy Cowgirl, is a daughter of 84"+ TTT, CV Cowboy Casanova, and 71" TTT, RJF Sweet and Sassy, who is a daughter of the awesome horn producing, 75.50" TTT, J.R. Sassie. There are 16- 70's and 9- 80's in his pedigree. Top of the breed genetics on top and bottom.